Winston-Salem State University’s University Choirs will present their annual Holiday Concert at 4 p.m. on Sunday, Dec. 2, at K.R. Williams Auditorium on WSSU's campus. The concert is annually one of WSSU’s biggest events. 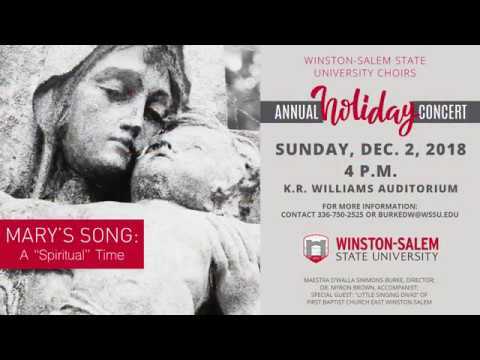 The Singing Rams – the Grammy-nominated WSSU Choir, the Burke Singers and the Singing Divas – will perform holiday favorites as they tell the story of the season. These ensembles have performed both nationally and internationally and recorded 11 CDs. Maestra D’Walla Simmons-Burke is director; Dr. Myron Brown, accompanist; Dr. Ronald Patterson, bassist; and guest percussionists. Special guests are The Little Singing Divas of First Baptist Church (East Winston-Salem). The concert is themed “Mary's Song: A 'Spiritual' Time.” Admission is free. Donations will be accepted. View the video promo below for a personal invitation and a preview of the concert.